With massive improvements from previous years, Online Taxes (OLT.com) may finally be a tax software worth considering. If you’re an experienced filer who wants an audit assistance guarantee at a low cost, OLT may be the right software for you. It’s not a perfect filing solution, but with it’s rock bottom pricing, many filers may be tempted by the offering, here’s what you need to know about filing your taxes using OLT.com in 2019. See how OLT.com also compares to our top tax filing software options. Who Should Use OLT.com in 2017? OLT.com continues to have a barebones user interface, but it’s significantly less complicated than previous years. OLT does not offer guided navigation, but its system for entering data is far more streamlined than before. The section headers are also generally free of overly complicated jargon. The one exception to the technical jargon came in the “Business Depreciation” section in which business owners and real estate investors are expected to know that form 4562 is for depreciation. Since OLT.com does not offer guided navigation, users have to figure out what sections apply to them on their own. Experienced filers will likely have an easy time of this, but newer filers may end up confused. For example, when I went to declare my capital gains, I had to figure out whether I needed to enter a 1099-B or a 1099-S form. Of course, for most people this is pretty easy. You should get a Form 1099-S from your brokerage if you sell stock in a given year. That said, once you find the right page, OLT makes it fairly easy to fill out each section. It offers helpful instructions on the side of each page to help users understand what needs to happen in that section. Overall, OLT.com’s navigation is best for experienced users who know exactly what they need. Inexperienced filers who want guided navigation should skip over OLT.com altogether. I also caught one annoying issue in OLT.com’s navigation. 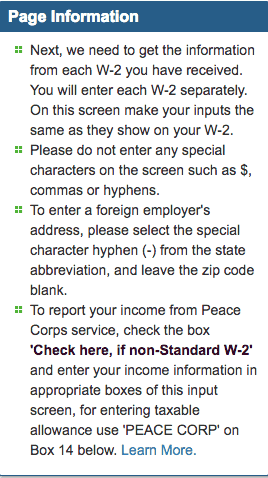 When I logged out, I had to verify all my basic info before I could click on the Income/Deductions section. This only happened to me once, but it was an annoyance. Though OLT.com has cleaned up the user interface, it’s still a bit clunky. It’s robust “Tax Reform” section means that OLT has better (and more relevant knowledge articles) than previous years. However, it continues to link out to the IRS website which means many users have to figure things out on their own. When it comes to helping users through the software, OLT.com has a decent selection of knowledge articles. The best articles are those it developed for its Tax Reform Section. Outside of these knowledge articles, the software often links out to the IRS website. While the link out to the IRS website may come in handy, other tax software systems tend to answer the most common questions directly in the knowledge articles. OTL.com has a free Federal plan (state $9.95 per return) or a premium edition. The primary difference between the two plans is that the second plan comes with audit assistance protection, customer support via phone, and live chat. The customer support representatives are both knowledgeable and helpful, but they offer tech support not tax support. Both plans give you access to all the major tax filing schedules, and you can import your data from the previous year. Who Should Use OLT.com in 2019? OLT.com offers value by including all the schedules with both it’s free and paid editions. If you’re a side hustler who is also an experienced tax filer, OLT.com may be an appropriate choice for you (especially with regards to audit assistance). In particular, people who get annoyed by guided navigation may find that OLT.com is a good choice. However, FreeTaxUSA offers a superior experience for just a few dollars more. It’s also important to note that inexperienced filers should probably stay away from OLT.com in 2018-2019. In most cases, H&R Block’s Free Plan for a better user interface at a lower cost. The post OLT.com Online Taxes Software Review 2019 – Massive Improvement appeared first on mimblewimble price blog.